Grammy-nominated electronic music producer and DJ Steve Aoki officially unveiled on Jan. 13 “I Love It When You Cry,” a collabo­ration with up-and-coming singer Moxie that gives fans their first taste of “Neon Future II,” the second part of his “Neon Future” double album due out this spring. The song has been a staple in Aoki’s live set since he debuted it at the TomorrowLand music festival and fans caught the pair performing it live during his headlining set at the Budweiser Made in America Los Angeles event last summer. Fans can listen to Aoki and Mox­ie’s “I Love It When You Cry” at soundcloud.com. The launch of the song precedes the Feb. 13 kickoff in Austin, Texas, of Dim Mak Presents Steve Aoki’s Neon Future Experience, with newly announced supporting acts Dirty­phonics, Botnek, Autoerotique, Max Styler and Reid Stefan on select dates, joining previously announced acts Headhunterz and Caked Up. Toronto has also been added to the routing on March 5 at Sound Acad­emy, and after the tour wraps Aoki will head to Miami for a headlining slot at the Ultra Music Festival during Miami Music Week. 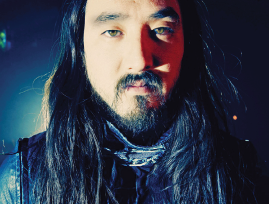 Aoki’s tour brings him to Pasa­dena, where he will join the Air & Style event at the Rose Bowl on Feb. 22. Free downloads of Aoki’s “Neon Future I” are available via Google Play for a limited time only, in the U.S. and Canada. Fans in both countries will be able to obtain the full album, which features popular tracks “Delirious (Boneless)” with Chris Lake and Tujamo featuring Kid Ink, “Rage the Night Away” featuring Waka Flocka Flame, and “Get Me Outta Here” featuring Flux Pavilion, for free. Tickets for the Neon Future Expe­rience tour are on sale now; for info, visit www.steveaoki.com.